Casserole is the French word used for a saucepan. The casserole is used in the oven as well as a serving dish. The term may also be used for the food that is cooked and served in such a dish. 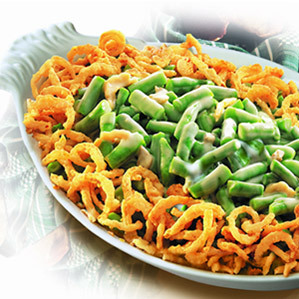 Green bean casserole is a casserole that consists of green beans, French fried onions and canned cream of mushroom soup. You can also use ground black pepper or soy sauce in these food recipes. Green bean casserole was invented by the Campbell Soup Company test kitchen led by Dorcas Reilly in the year 1955. It is a popular Thanksgiving side dish in the United States. Following are some delightful recipes for green bean casserole, which also have great nutritional value. In a 1½-quart casserole dish, mix together cream of mushroom soup, pepper and milk. Then add cooked green beans and 2/3 cup of fried onions. Bake this mixture at 350°F for about 25 minutes. Top with remaining 2/3 cup fried onions and bake it for 5 more minutes, until onions become lightly brown. Preheat the oven to 350°F. Melt 2 tbsp butter over medium heat in a large skillet. Then add all-purpose flour, until the mixture become smooth. Cook it for about one minute. Then add onion, sugar, salt and sour cream and mix well. Add green beans and stir. This mixture should be transferred to a 2½-quart casserole dish. Top with shredded cheese. In a small bowl, lightly mix cracker crumbs and remaining butter and sprinkle it over the cheese layer. Bake this mixture in the preheated oven for about 30 minutes, until cheese is bubbly and top turns golden. Cook and season the pork chops in preheated oil in a pan. Rinse thin slices of potatoes and pat dry. In a mixing bowl, mix well milk, mushroom soup and sour cream and add this mixture to the bottom of a 13-9" casserole dish. Then add a layer of ½ soup mixture and potatoes. Each layer should be lightly covered. Arrange pork chops in a single row across the mixture. Mix together soup mixture and frozen green beans and spread this mixture over the pork chops. Bake the mixture for about 30-40 minutes at 400°F in the preheated oven. Cover the top using a foil and place it on a baking pan in order to avoid spillage. TO MAKE AHEAD The day before, cook the beans, make the sauce and combine; mix the topping but don't add it yet. Before dinner, bring back to room temperature, allowing plenty of time, especially for a double or triple batch; bake at 425F for 10 - 40 minutes until bubbly. Apply topping and bake for another 15 minutes. Bring the water to boil in a large pot or Dutch oven. While it comes to a boil, prep the beans. Fill a large bowl with ice water. Add the salt and beans to the boiling water. Cover and cook for 6 minutes or until crisp-tender and still bright green. (Be sure to cook the beans to your desired level of doneness; from here on, they will reheat but won't cook more.) Drain beans in a colander, then plunge into ice water to stop the cooking. Drain a bit in the colander again. Place a double layer of paper towels on a baking sheet, arrange beans in single layer to dry, top with a double layer of towels and pat to dry. Let continue to dry while finishing. Clean the mushrooms; break off and discard the stems. (Better yet, use the stems to make a night-before mushroom soup.) Break the mushroom tops into pieces. (Breaking the tops into irregular pieces is important to the texture of this sauce for sliced mushrooms have a 'canned soup' texture.) Melt the butter in a skillet til shimmery. (To save a pan, use the pot used for cooking the beans.) Add the mushrooms, garlic, salt and pepper. Stirring often, cook til mushrooms begin to soften and exude their liquid, about 6 minutes. Stir in flour and cook a minute. A tablespoon at a time at first, add the chicken stock and sherry; bring to a simmer. Add the half & half, simmer til sauce thickens, about 10 - 15 minutes. Taste and adjust the seasonings. Stir in the cooked beans til they're evenly distributed throughout the sauce. Note: The quantity below is 'half' what the inspiring recipe used; the full amount seemed way over the top to me, half was plenty and hardly skimpy for the shallow quiche dish I use to bake this in. I use the quantity below even when doubling the beans and the mushroom sauce; how much is needed seems to be a function of the size of the serving dish; 'half' is perfect for that shallow quiche dish. In the food processor, process the bread, butter and seasonings in about 10 quick pulses. Stir in the onions -- but don't process. If making ahead, transfer to a storage container and refrigerate. TO BAKE RIGHT AWAY Preheat oven to 425F. Transfer hot bean mixture to a greased quiche pan or baking dish. Top the beans with the topping mixture and bake uncovered for 15 minutes. TO BAKE LATER Transfer bean mixture to a greased quiche pan or baking dish (hold off on the topping mixture), cover with plastic wrap and refrigerate. Return to room temperature. Remove plastic wrap. Heat in 425F oven uncovered for about 10 - 40 minutes until hot and bubbly. (Ten minutes is enough for a shallow dish like a quiche pan. Allow more time for a deeper dish.) Add topping and bake for another 15 minutes.